The steel and concrete structure, nicknamed La Paloma (the Dove) because of its resemblance to a giant bird about to take flight, is integrated into the hilly green landscape in the Txoriherri Valley in close proximity to Bilbao. 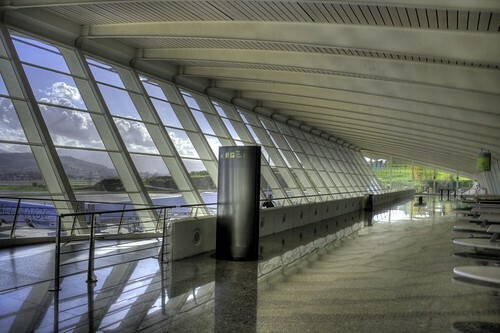 The aluminium skin of the Central Terminal sweeps across the 140 meter long terminal entry, providing cover for multiple levels of arrival and departure. The layout was designed to limit the impact of auxiliary buildings on the vista of the main building. An elegant four-storey parking structure, with a skylit walkway leading to the Terminal Building, is tucked into a grassy embankment. How to get there? From Bilbao city centre you can reach the airport most easily by Bizkaibus A-3247 within 30 minutes.